William Duke was born in Hursley, Hampshire in 1833 and baptised there on 6 October. He was the son of the agricultural labourer John Duke and Harriet Snow, who were married at Hursley on 6 September 1828 and had seven other children: Ann (1829), John (1831), an earlier William (1833), Henry (1837), James (1843), Charles (1846), and Ellen (1852). At the time of the 1841 census William (7) was living at Hursley with his parents and four of his siblings. By 1851 William (17) was a pantry boy at Radley College near Abingdon, which was then in Berkshire; and by 1858 he was working as a college servant in Oxford. Mary Ann Brown was born in the Jericho area of Oxford on 3 August 1830 and baptised at St Giles's Church on 1 September. She was the daughter of Thomas Blakeman Brown and Sophia Townsend, who were married on 25 November 1822 at Standlake Church. Mary Ann's father was originally a baker, but by 1833 he was Inspector of the University Police in Oxford. For more about the rest of her family, see the separate grave of her parents. In 1841 Mary Ann (10) was living with her parents in Observatory Street; by 1851 they were living in St Giles's Road (the south end of the Woodstock/Banbury Roads); and by 1857 they were at Park Place. Louis [or Lewis] Douglas Duke (born at Ship Street in 1873 and baptised as Lewis Douglas Duke at St Michael's Church on 1 June; but birth registered as simply Douglas Duke). At the time of the 1861 census William (27) and Mary Ann (30, but recorded as 27) were living at Little Clarendon Street with their first daughter Eliza (1) and their 13-year-old servant girl. William's brother Charles Duke (15) was paying a visit, and they were both described as college servants. They spent a short time living in the High Street, Oxford around 1864. 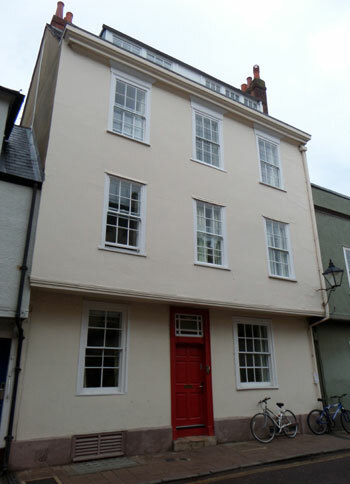 By 1867 William and Mary Ann Duke had moved to 13 Ship Street (right), and when his son was baptised in 1870, William was described as a college butler (probably at Exeter College). In 1871 William Duke (37) was living at 13 Ship Street in 1871 with his wife Mary Ann (40, but recorded as 37) and their children Eliza (11), William (8), Charles (6), and John (3), plus Mary Ann's niece Clara Brown (8), and a servant. † Mrs Mary Ann Duke née Brown died at Ship Street at the age of 45 on 15 April 1876 and was buried at St Sepulchre’s Cemetery on 18 April (burial recorded in the parish register of St Michael's Church). Her effects came to £179 5s. 7d., and her husband William was her executor. At the time of the 1881 census William Duke (47) was described as the Common Room man of Exeter College. He was living at 13 Ship Street with four of his children: Eliza (21), who was a teacher of music; William (18), who was a cook; and John (13) and Lewis (8) who were still at school. They employed a cook and a house servant. His other son Charles (16) had already left home and was a hairdresser's apprentice, living in Warwickshire at 106 Warwick Street, Leamington Priors with the hairdresser Alfred Turner and his family. Beatrice Anne Duke (born at Ship Street, Oxford in 1884 and baptised at St Michael's Church on 9 August). In 1887 (reg. third quarter) in the Woburn district (probably at Salford, Bedfordshire), William Henry Duke married Elizabeth Harriet Druce. At the time of the 1891 census William Duke (57), a college servant, was living at 43 Leckford Road in north Oxford with his second wife Eliza Jane (42) and their daughter Beatrice (6). Two of his children from his first marriage were living with them: John (23), who was an upholsterer, and Lewis (18), who was a cook's apprentice. On 3 July 1897 at Ss Philip & James's Church, Louis Douglas Duke (24), a cook of 43 Leckford Road, married Mary Ellen Griffiths (28) of 118 Kingston Road, the daughter of the carpenter William Griffiths. At the time of the 1901 census William (67) was still working as a college servant and living at 43 Leckford Road with Eliza Jane (52) and their daughter Beatrice (16). 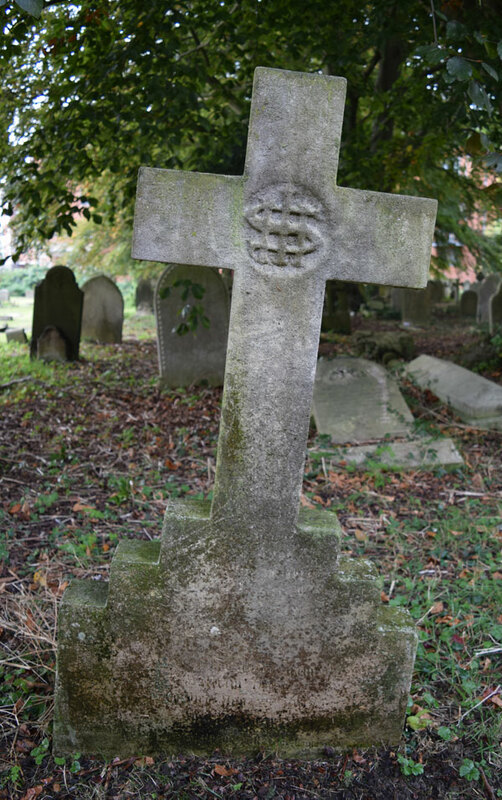 † William Duke died at 43 Leckford Road at the age of 70 on 25 November 1903 and was buried at St Sepulchre’s Cemetery on 28 November (burial recorded in the parish register of St Michael's Church). His effects came to £3,523 19s. 8d., and his executors were his son William Henry Duke, who was now a college chef, and the widow Mrs Eliza Jane Duke. Eliza Brown Duke, Mrs Frederick Thorogood (born 1860) was in 1891 living with her husband Frederick, who was a schoolmaster, and their son John (6) at 35 Walton Street, the home of her parents-in-law. In 1901 Eliza (41) and Frederick (42) were living at 135 Walton Street with their son John (16); Eliza's mother-in-law Amelia Thorogood was living with them, and they had a servant. By the time of the 1911 census Eliza's husband Frederick Druce Thorogood had been admitted to the Littlemore Asylum and Eliza (51) was boarding alone with the White family at 20 Plantation Road. Frederick Druce Thorogood died at the Littlemore Asylum on 22 July 1911: his effects came to £406 7s. 1d., and Eliza was his executor. Eliza herself died at the London Road Hospital in Headington at the age of 84 in September 1946. William Henry Duke (born 1862) and his wife Elizabeth had four children: Dorothy Druce Duke (born Oxford 1888), William Druce Duke (born Oxford 1889/90), Violet Druce Duke (born Salford, Bedfordshire in 1894), and Alexander Druce Duke (born at 51 Walton Crescent on 17 November 1898 and baptised at St Paul's Church). At the time of the 1911 census Henry (48), described as a college manciple, was living at 31 Wellington Square with his wife Elizabeth and their children Dorothy (22), who was an elementary school teacher; William (16), who was an electrician; and Violet (16) and Alexander (13). William Henry Duke, described as a chef of 31 Wellington Square, died on the Island of Guernsey on 16 April 1912. His effects came to £566 8s. 8d., and his executor was his widow Elizabeth. Charles Duke (born 1864) is hard to find after 1881. John Duke (born 1867) was an upholsterer's foreman in 1901, living at 6 Ledbury Road, Reigate with his wife Agnes and their daughter Hilda Mary Duke (5). By the time of the 1911 census he was back in Oxford: John was now a Park Constable, living at North Lodge of the University Parks with his wife and two children Hilda (15) and Frank Leslie Duke (4). His wife died in Oxford in 1945, and John in 1947. Lewis [Louis] Douglas Duke (born 1873) was the Steward of the Clarendon Club in 1901 and living on the premises at 54 Cornmarket Street with his wife Mary and their son Louis Alfred Duke (2). They then went to Dublin, where their daughter Evelyn Mary Duke was born in c.1905. At the time of the 1911 census Louis and his wife were managers of the Naval & Military Hotel at Hampton Road, Kensington. Their son Louis Alfred (12) was living at 30 Southmoor Road with the family of his uncle, the compositor Thomas Griffiths, while Evelyn was with her widowed grandmother Hannah Griffiths at 86 Kingston Road. His son Louis Alfred Duke was killed in 1917. Louis Douglas Duke emigrated to Canada at the age of 48, arriving on 28 July 1921 with the intention of becoming a farmer. He was not accompanied by his wife, but he named her as his next of kin and stated that she lived in Sonning-on-Thames. Beatrice Anne Duke (born 1884) married Henry Burbank Musgrave, a Summertown chemist and the son of the farmer Samuel Musgrave, at Ss Philip & James's Church on 9 July 1907. Their son Raymond Henry Duke Musgrave was born at 43 Leckford Road, Oxford in 1910, and they appear to have had a daughter, Audrey Beatrice Musgrave, in Reading in 1917. Beatrice's husband died in 1944, and she was still living at 43 Leckford Road when she herself died at St Joseph's Nursing Home, Boars Hill, on 1 June 1961. Her effects came to £150.